There are the times that you go to a new project meeting not sure what to expect... and this was definitely one of them! I was just getting my business into FULL swing and I received an email from a young couple in Sherman, Texas. They had just purchased a "fixer-upper" type house and were looking for help mixing their design ideas into one cohesive vision. (Side note: Just because you vow “death do us part” doesn't mean you will agree on your love for all things vintage!) From the moment I met the energetic husband and the endearing wife, I was hooked on making their dream a reality! It was summer and the house had no electricity, so we sweated to the oldies and formulated a plan. The house was in disrepair but it had great bones to serve as our starting point. The couple were very prepared for their first remodel, even opting to do some of the work themselves! During our first meeting we reviewed images they had compiled of their favorite spaces, decided what needed to stay and what definitely had to go and brainstormed every other option in between. The project was an hour and half from my office and they wanted to move in quickly so we needed to be super efficient. Starting with a floor plan we devised solutions to turn funky into functional and bring them into the current style. The long wall in the kitchen was broken up with a door to the hallway and a HUGE soffit above the cabinets. The floors were plywood and there was a portion missing so you could see earth underneath! Did I mention it was a fixer-upper? The shorter wall in the kitchen shared space with a great breakfast nook, unfortunately it was so closed in with a small door to the dining area. The cabinets on this side were basically unusable due to their height and there was little prep space adjacent to the stove top. Enclosing the door to the hallway gave us plenty of space for extra counter and cabinets. We were also able to sneak in a wine fridge and appliance garage. Who doesn't want that? White cabinets are crisp and fresh with the stainless and nickel hardware and the countertops play well off the neutral and sage backsplash. The hardwoods are reclaimed from an older home and leaving them in the original mixed finish adds charm and personality to the room. 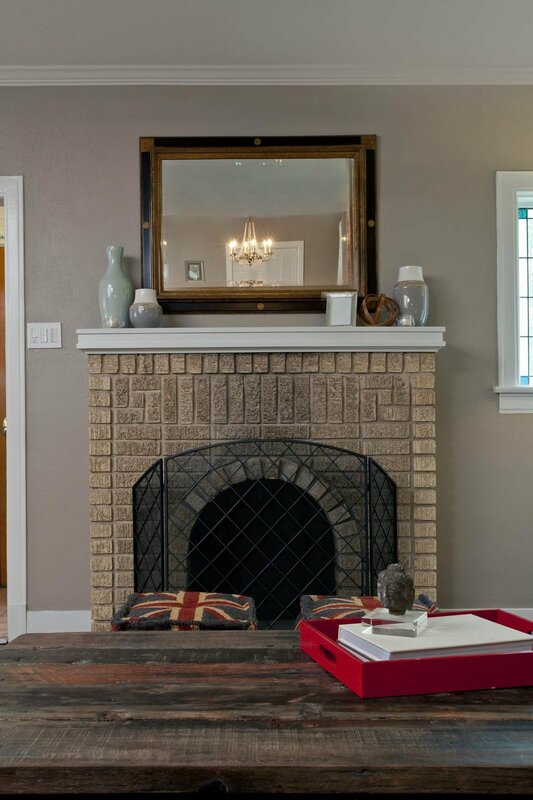 To create a more openness, the entry was enlarged to mimic that of the dining room. With the sink now on the shorter wall and by omitting the separate double ovens, there is much more counter space adjacent to the sink for prep work and dish duty. We tucked the microwave on a shelf in the far side of the cabinet to keep it out of sight. The breakfast area is now a bright spot to grab coffee in the morning or wind down with some wine in the evening. Sage green walls hark back to the accent tile in the backsplash and play nicely with the blue patterned window seat cushion. Antique style chairs in the same sage color blend nicely without competing. The window seat hosts storage drawers because you can NEVER have enough storage! 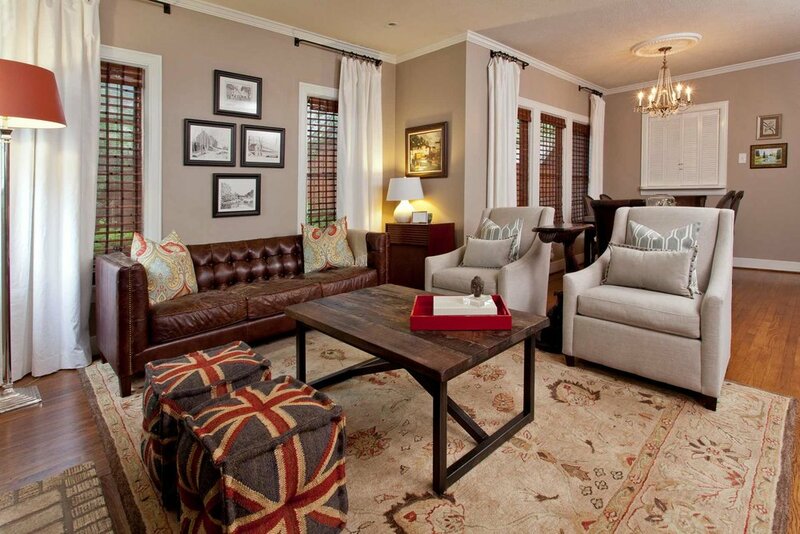 Cozy layout and a mix of textures create a warm family space. I always joke that interior design is cheaper than marriage counseling... although I'm not too sure that’s actually true. But it pokes fun at the hardest part about couples putting their personal stamp on their space which is that people can love each other and really rock at doing life together... but start talking modern vs traditional and you'll strike down to the core! I love being the guide on the journey so that everyone gets a taste of what they like so they can truly see themselves reflected in their home while still seeing their partner there as well! I'd love to say this is the story of this house, but honestly it’s just the story when it comes to design.... but this is the story of this house! Wife loves modern, husband loves old world. This couple moved into this amazing Tudor from an uptown condo when their family grew by one! After a few years of living with their past furnishings, they grew tired of how nothing from their condo really fit this space! They had some unique items (I'm talking to you awesome fish side table and vintage record cabinet!) and some sentimental art work that a beloved family member created. They met with me once they had some selections in mind and I worked with them to fine tune the details so that the space would work as an entertaining space when adults were over, but also be a cozy home for a young family. Distressed leather and wood are ideal for family spaces they will experience a lot of abuse! I think every room deserves a little richness and some great contrast. The crisp white curtains against the deep leather couch are elegant and welcoming. If the coffee table need to be used for crafts…great! Pull up a Union Jack and get down to business. Hello original brick! We won’t be painting you! The rich detail of this Tudor home lend a LOT to the design so we highlighted the gorgeous leaded windows and cream brick with the perfect griege paint color. Pops of red and light blue make sure the room isn’t too serious. This is really a family home, so the concrete table top is ready for homework and take out as well as a nice glass of wine with friends. I love its slick surface in contrast to the woven window shades and original crystal chandelier. Charcoal grey chairs will surely hide the mess of daily life with real richness. A teenage girl is a fantastic muse! Especially if she has a spunky mom that wants to surprise her with a new room for her Sweet 16. We worked to update her room from the lavender fairy princess to a playful room where she can "like totally have friends over!" We were diligent about the budget since teenagers don't necessarily go easy on their bedrooms. So by mixing some great bargain finds like the mirrors we had painted, a chandelier with great sparkle with some designer fabrics the room feels complete without draining the wallet. Our goal was to create a hip and timeless room that reflected our teenage gal's playful personality, while still using her great antiques. How do you make antiques feel young you ask? Throw in some bright pops of color to make them feel less "grandma" and more "boho". How do you make it Bohemian enough for a teenage girl but classic enough for a mom with impeccable taste? Keep the pops of color tailored and geometric while mixing the different hues. Before this corner of the room was a catch all for all things "teenager". Now our gal has a cozy spot to text her friends...oh wait, I mean study! We found a chair with antique lines but added a pop of pink and blue to give it some youthfulness. Tailored Roman shades ground the space with their strong pattern and great color. To store away some of the aforementioned teenage accouterment, a nightstand with mirrored doors adds sparkle while keeping clutter under wraps. To keep it light hearted, a fanciful mirror painted pink and a pair of horse lamps flank the bed. I love all the mirrored surfaces in this room! Custom bedding in an array of bright hues lend a lot of playfulness to the antique bed. The large yellow euro pillows are made from an indoor/outdoor fabric so they can easily be drafted as floor pillows without worrying about them getting ruined. A pretty monogrammed coverlet and patterned throw pillow tie all the rooms colors together. By recovering the vanity chair and dabbling some pretty accessories, the vanity area is ready for the daily glam routine.